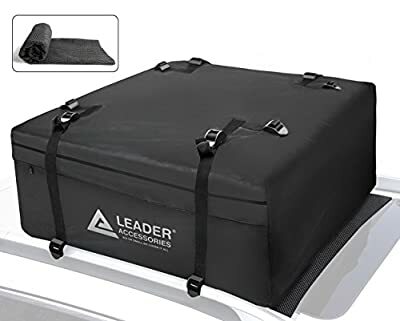 1.Leader Accessories Roof bag products is designed for those outdoor enthusiastics, they are willing to bring all family members to go out for adventure, bring kids close to the nature, to help them no warry about bring as much stuff as they can. 2. It is big enough for all family member camping and road trip stuff, like two big travel luggage case, camping tent, camping sleeping bag, camping chair, hammock, folding table etc. 3.Easy installation and 4 pcs of 1.5" strong straps is including for securely fasten to your car roof rack. 4. Extra 2 straps with buckles is for you secure the big and heavy stuff inside the roof bag, to make sure it is well secure and not easily moved during road trip. 5. Folds compact for easy storage. Overall packed size is 44'' x 34'' x 17''. WATERPROOF rooftop cargo bag with 15 cubic feet of space ANTI-SLIP PAD- Use the reinforced, rubberized mat under roof racks to help keep cargo from slipping during transit. Increases vehicle cargo space. Designed to fit all roof racks with attachment capabilities on all four sides, if less than four, caution needs to be taken for secure attachment. Soft sides flex to fit odd-shaped loads Overall size is 44'' x 34'' x 17''.